Cold, dark nights are best dealt with next to a warm, bright fireplace. Who doesn’t like to cosy up by a dancing fire or warm up by the smouldering logs – sustainably sourced, of course! – when it’s below freezing outside? With a fire comes responsibility. Especially when you have little ones or pets at home, keeping them safe from the fireplace becomes an even more critical task. To help you, we have put together an easy guide of things to look out for and actions to take to help keep everyone safe and warm this winter. Pets should be well trained to steer clear of the fireplace. Similarly, young children should be taught of the danger of being close to the fireplace or stove, regardless of whether it is lit or not as that will reinforce the message. Even if you have a gate in place, teaching your children and pets to stay well back will help reduce the risk of them getting hurt. This one applies to both children and pets too. Avoid rough-and-tumble games with your dog as you can’t always control how one of you may fall or roll. Sensitive paws and wagging tails can get badly burned by the flames. 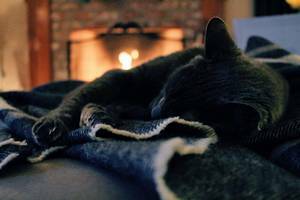 Also avoid using any treats or toys near the fire – again, pets can inadvertently get caught by the flames and end up hurt. Train your pets that play is for another room. Keeping all their toys elsewhere and not allowing them to have them near the fire is a good way of doing this. Little ones should also have separate play areas to reduce their risk of dropping something in the fire and reaching in to grab it, or falling into it accidentally as they mess around. There are so many options on the market that the chances of not finding something that suits your taste and budget are very low. Glass doors are an option, although consider the curiosity factor of little ones who may want to reach out and touch it. Alternatively, a gate can be a stylish addition to your room. Keep it in place at all times to reinforce the message that the fireplace is off limits. Kids may see them as toys and larger dogs could topple them over causing injury. While keeping them close to the fire may be convenient the risk is not worth the effort of reaching behind the gate to get the tool you need and keeping them far from reach of mischievous little hands and wagging tails. We are a family-run business offering you a wide variety of fireplaces to choose from at our fireplace shop in Eltham, London. Copyright © Fiveways Fires & Stoves Ltd. All rights reserved.